How to Plan Your Garden: Start Early! I hope you are reading this somewhere cozy enjoying that delicious sensation of being warm and safe when it is cold and wintery outside. The past few days have finally brought what feels like real winter temperatures to the MidAtlantic region, the tender annuals are brown and dry, and thoughts of the garden’s fresh bounty seem distant. One thing I love about a four-season climate is the opportunity to rest, reflect, recharge and plan between growing seasons. 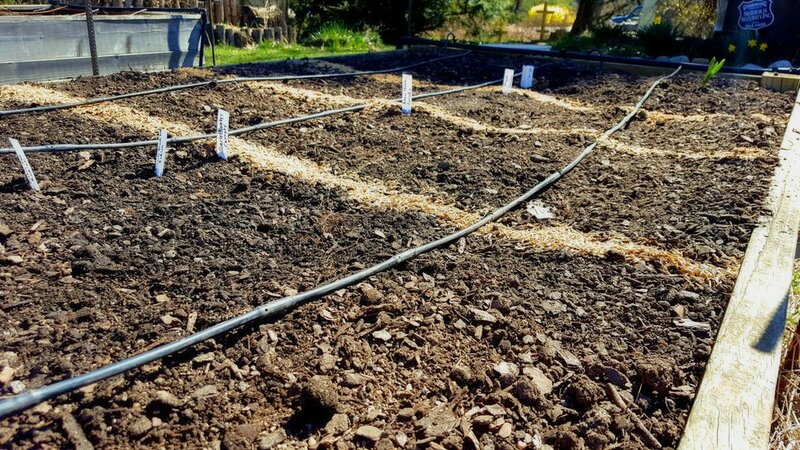 While we know that the old adage “make a plan and make god laugh” certainly holds true with any sort of farming or gardening, it’s also true that a garden plan can serve as a vital road map when navigating the fluctuations and challenges of a growing season. Here at Edible Eden we create garden plans using Excel (although there are numerous aps and programs these days that purport to simplify the process). I like the Excel solution because it allows me to think strategically about the varieties, successions and rotations I want to include in my plan. Of course if your plan calls for a March 2 seeding of radishes and March 2 is a blizzard with frozen solid soil…obviously you will need to shift your timeline, but having the basic road map of how many of any given crop to plant where, on what date really helps maximize your yield because you an estimate how many successions you can fit into any given space. One of the things I love about both landscape design and garden planning is that you are applying a blend of creativity and knowledge across a spectrum of dimensions- certainly time, space, height…but also temperature; remember that the same beet that claims 50 days until harvest in June will take a lot longer to reach maturity in the fall as the hours of sunlight wane and growth slows down (even if the temperatures stay warm). That brings me to the question of timing. It would be fantastic if there was a hard and fast rule about any given element of garden timing. The truth is- especially in light of climate change- getting the timing right in your garden is like learning to dance on a moving carpet. This past year I had all my tomato plants in the ground by the end of May and felt very proud of myself. And when the weather conditions conspired to welcome in heavy populations of fungal diseases and blight, most of my tomatoes died and I was very sad. Can you guess what happened? The late planting avoided the worst of the fungal diseases, and the warm weather lasted longer than usual…and we were picking ripe tomatoes for Thanksgiving dinner! All this to say, the winter is a great time to plan, dream and prepare for the growing season even though you never know how the season will play out! some help with your garden plan contact Edible Eden for a customized road map for your 2017 growing season. You may have seen it your neighborhood -- the spider webs, cackling pumpkins and plastic skeletons have been replaced by gourds and hand-traced turkeys taped to the window. October has come and gone, and Thanksgiving is quick on its heels. For gardeners nationwide, the next thirty days are a last breath of life before the winter freeze. Many are wondering how to get the most out of their edibles before it’s too late. Here at Edible Eden, the start of November harkens the beginning of Reemay season. What is Reemay? Reemay is a type of cloth-like fabric, generally made of polyester or polypropylene, which can be stretched over just about any garden plant. The fabric lets in about 75% of all sunlight while helping the plant retain heat and ward off bugs. As the weather gets colder, Reemay is crucial for extending the life of your garden. Reemay should be set up as soon as the weather starts to turn, we recommend getting it up as soon as possible! Leave it on through the New Year, by which point even a covering of Reemay won’t be enough to ward off the winter. Reemay is perfect for any late fall crops, like cabbage, kale, arugula, spinach or carrots. By waiting as long as possible to harvest them, they grow sweeter. Reemay fabric can extend the life of your garden by several months and can result in plenty of extra pounds of produce. If you have even a couple of food plants in your garden, It makes sense to consider covering them for the next couple months. To set up Reemay, we first stretch metal or PVC hoops over the garden to suspend the Reemay without crushing the plants. The fabric is anchored by garden staples pushed into the soil, or, if you’re on a budget, weighed down by rocks. Interested in ensuring your fall harvest is as bountiful as possible? The garden gurus at Edible Eden can get your Reemay set up in an quick afternoon session. To learn more visit edibledenfoodscapes.com/contact.